Tried many fad diets, instant weight loss programs and slimming therapies and not satisfied with the results? It’s time to rethink everything you once held true about weight loss. A reliable weight loss regimen should have 2 qualities – nutritional diet + burn calories. When it comes to burning calories, you know the drill – exercising, brisk walking or yoga. Well, here we will talk about Garlic – A natural antibiotic and latest nutrient in the battle of weight loss. 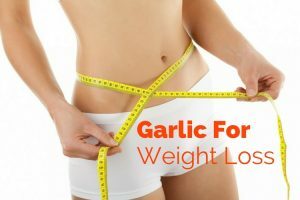 Garlic for Weight Loss – What’s so Beneficial About it? Garlic stimulates the satiety hormone which reduces binge eating, sugar cravings, junk food, and oily stuff. It releases the norepinephrine, a neurotransmitter which boosts metabolism. The allicin present in it lowers blood pressure, cholesterol and insulin levels. Garlic inhibits the process breaking down stored fats. It is a powerful detoxifier and effective diuretic. It contains trace minerals (sulfur, selenium, magnesium, zinc, copper and iron), amino acids and vitamins A, C, and E.
It helps to dissolve blood clots that lead to heart stroke. It helps to remove excess mucus from the body. How to Include Garlic in Your Weight Loss Routine….? Let it sit for 10 minutes. Because when raw garlic interacts with oxygen to produce allcin. Use it to season foods, sauce, soups and salad vinaigrettes. Alternatively, you can chew 2 garlic cloves on an empty stomach or before going to bed. Remember to brush your teeth to reduce garlic smell. Puree the garlic cloves in a blender. Strain the mixture to the collect the juice. Drink 1 teaspoon garlic juice followed by a glass of lukewarm water. For added taste, mix 1 teaspoon honey to the garlic juice. Squeeze juice of 1 lemon in a cup of water. Chew 3 garlic cloves followed by the lemon water. Or add crush the garlic cloves, stir in the lemon water and drink. Repeat the process every morning. Combine 1 teaspoon each of garlic juice, honey and apple cider vinegar. Consume it daily before breakfast. Stir in the mixture in a glass of water and drink it. For added benefit, include a pinch of cayenne pepper and 2 tablespoons lemon juice. Combine 1 cup each of garlic juice, ginger juice, apple cider vinegar, and lemon juice. Simmer the mixture in low heat until it reduced to 3 cups. Remove from the flame and let it cool down to room temperature. Add 1 cup honey and store in an airtight container. Drink 1 tablespoons of the mixture daily before breakfast. Crush 2 garlic cloves and stir in a cup of raw milk. Let it sit for 10 minutes and consume it daily on an empty stomach. Crush 3 garlic cloves and stir in a glass of milk. Bring this mixture to boil until the quantity reduces to half. Let it cool down to room temperature and drink. For added benefits, stir in 1 teaspoon honey or a pinch of black pepper. Grate 4 chunks of ginger root and mince 4 cloves of garlic. To 500 ml of boiling water add ginger and garlic. For extra benefits, you can add juice of 1 lemon and 1/2 teaspoon cayenne pepper. If you are on alkalizing diet, add 1/2 teaspoon honey. Scoop out the gel from aloe vera leaf. In a blender, add 3 cloves of garlic and 2 inches of ginger root, juice of half lemon and aloe vera gel and blend till smooth. Add 1 tablespoon honey and blend again for 30 seconds. Pour the mixture in an air tight container and refrigerate. Consume 3 tablespoons of the mixture 3 times daily. Grate 1 inch fresh ginger and mince 1 clove of garlic. In a cup of boiled water, add garlic, ginger, 1 teaspoon cinnamon and 1 green tea bag. Stir in 2 teaspoon raw honey and drink it. Blend 1 teaspoon carom seeds and 2 cloves of garlic. Consume this mixture followed by a glass of lukewarm water. Repeat 2 times a daily. Listed are few different versions of salad dressing with garlic. Combine 1 teaspoon minced garlic, 3 tablespoons lemon juice, 2 tablespoons olive oil, a pinch of black pepper, 1/2 teaspoon cumin powder and 2 tablespoons red wine vinegar. Stir in the mixture in a cup of vegetables or beans or cooked meat. Alternately, you can just mix 1 teaspoon of minced garlic, 1 tablespoon olive oil and a pinch of black pepper and use the mixture as dressing. Instead of store brought dips, replace it with this recipe. In a blender, add 6 garlic cloves, 1 tablespoon sea salt, 1/2 cup lemon juice, 1 cup olive oil and 1/2 cup vegetable oil. Blend the smoothie until it reaches a texture similar to mayonnaise. In a blender, add 4 garlic cloves, 3 leaves lettuce, 1/2 celery stalk, 3 pepper corns, 2 steamed asparagus, half cucumber, 1 teaspoon flax seeds. Blend for 4 minutes and drink it. Grind few garlic cloves, stir in the bread batter and bake. Alternately, slice garlic cloves and rub the inside of it on bread. Crush 2 cloves of garlic and add to a cup of boiled water. Allow it to steep for 10 minutes, strain it and let it steep cool down to room temperature. Add 1 teaspoon honey, stir and consume. For extra benefits, add 2 teaspoon of lemon juice. Mince 12 garlic cloves and stir them in jar of 1/2 liter of red wine. Close the jar and place it where it can get direct sunlight. Don’t disturb the jar for 2 weeks. Consume 1 teaspoon of the mixture 3 times a day. Make a new batch of mixture after 6 months gap. Mix 1 teaspoon of garlic powder in a glass of water or lemon water and consume it. Mix 1 teaspoon each of garlic powder and honey. Lick the mixture followed by a glass of water. Don’t consume more than 4 raw garlic cloves a day. Patients with heart problems, pregnant and lactating women should consult doctor before trying garlic. Possible side effects of consuming raw garlic – heartburn, flatulence, lower blood pressure and upset stomach. Stop taking garlic if you observe any of them. Avoid garlic intake before any surgery as it can disturb anti-coagulants. Asthma patients should avoid intake of garlic. If you have cuts or undergone surgery recently, avoid garlic as it prolongs bleeding. Avoid junk food, fried and oily food. Consume fresh fruit juices and vegetables. Avoid binge eating, smoking and alcohol. A perfect weight loss regiment is incomplete without physical exercising. So brisk walk for 15 minutes or do yoga regularly to burn more calories. Did you find this article helpful? You can also check out this article to find out about other great DIY home remedies for weight loss. If you have any queries, write to us in the comments section below. I tried garlic for the first time with empty stomach, I felt low blood pressure for some time, should I continue eating it. Nope, it doesn’t have any effect on your family life. To make the garlic and red wine recipe, can u recommend any wine? Until you achieve the desired weight and improve your metabolism, you have go on with garlic therapy. Can the galic tea alone make u lose the weight.and how often should i drink the garlic tea. Yes, garlic tea can help you boost metabolism and reduce fat gradually. However if you want effective results, apart from garlic tea, you have to exercise daily and eat nutritious food. how can l clear garlic smell? l usually take my garlic with with green tea. Drinking lemon water or lemonade helps to get rid of garlic smell. Can I drink it with lime juice? Into a glass of warm water, add juice of ½ lemon, 1 tablespoon honey and 1 teaspoon crushed garlic. Mix well and drink it on an empty stomach daily. Apart from that exercise daily, consume nutritional food, drink plenty of water and avoid junk food. Can I take garlic with lemon nd zeera water in morning?? please reply…. Can I take garlic with lemon water before sleeping at the night time.??? Taking lemon, garlic and jeera water is more effective in the morning than night. I had belly fat.I am eating garlic daily .could it works out without doing any exercises.?………. Nope, garlic helps to boosts your weight loss regimen. If you want effective results, you have to do at least brisk walk for 15 minutes daily. Is it loose weight faster??? Can I blend the garlic and lemon water together? And can I add honey to that. Can I use 3 cloves of garlic in an omelette instead of chewing it? Adding garlic into your omelet cannot provide any results. You have to eat the garlic raw for getting the results. I mince up harlic, let it sit for five minutes then add raw unfilteted honey and drink it down with ACV and filteted water. I do this in the morning and before bed. In addotion I also eat six roasted garlic pettles with lunch or dinner. What is your opinion? Apart from that exercise daily for at least 30 minutes or brisk walk for 15 minutes. Drink plenty of water throughout the day and eat nutritional diet. Apart from eating garlic, you have to exercise regularly, eat nutritional food, avoid unhealthy food and drink plenty of water. Garlic only boosts your weight loss regimen. Nyce nyce.it realy works wonderfully if u follow the steps stated above. While brewing the tea, add few drops of garlic juice, ginger juice and lemon juice. Remove from the flame and drink it. As all the ingredients are natural and effective in boosting up fat burning, you can try this combination. I am using a waist trainer, drinking lots of water and drinking slimming tea everyday. can I also use garlic and don’t exercise? Nope. Garlic only boosts your weight loss regimen. You have to exercise regularly to achieve effective results. It usually depends on the person’s fat burning capacity, calorie intake, and other factors. So, it is difficult to tell the exact time frame. For effective results, apart from trying garlic methods, exercise regularly, reduce calorie intake and drink plenty of water. We recommend consulting your doctor before trying it as garlic can interact with some medications. Yes, it is. Apart from that make sure to eat nutritional diet, drink plenty of water and exercise regularly. Nope, it is better to mince or chop it before consuming. Because it helps to release the allicin content in the garlic that contains the beneficial properties. I use to have ulcer and I am taking garlic,can it make it worst or reduce the ulcer pain? can I eat the garlic at night. sincerely to lose weight one has to be on strict diet and make sure one does exercise. I have been taking ginger and lemon and I is working I exercise too and I am on diet too. I just came across Garlic at the market today when I went to purchase my ginger and I came across your blog. so great I have learnt a lot. It is difficult to tell the exact time frame as it depends on the fat burning capacity, metabolism and other factors. So, we recommend trying the method regularly until you achieve the results. For effective results, exercise regularly, eat nutritional food and drink plenty of water. At the beginning of this year, my pressure was increasing higher and higher and has almost reached 147/103. I was getting frustrated since it was not coming down even with diet adjustments. I took crashed garlic on an empty stomach in the morning for a week and my pressure is now back to normal… last taken was 120/80. is it possible to just swallow as in the garlic, ginger, lemon, so that i prevent the sour taste in my mouth but still lose weight? Can I take raw garlic with water as we take our medicine…. my tummy is still big after child birth, although my baby is four months old. can I take 2 garlic night and morning for flat tummy. I eat 3 cloves of garlic for every morning with empty stomach. if it is have any side effect? I grind my ginger, garlic and lemon for over 1 week now, can i still take it? Just started few days and seeing results. Just stick to the instructions you will get there. I tried this but sadly I didn’t feel good after 3-4 days. I tried crushing it and having it with honey in empty stomach @morning. My body started to itch and I felt drained out. is it natural? Or should I stop it? Am a cardiac patient on warfarin,can I still take the galic juice for weight loss? Can brestfeeding women drink milk by adding garlic. i am using garlic from around 4 to 5 months but no suffiecent effect i have seen . doingzumba dance also for 35 mins . Pleaae Is garlic and lemon best drink at night or in the morning on an empty stomach? Please is garlic and lemon better taken at night or early morning on an empty stomach? Would Kyolic garlic tablets help with apple cider vinegar. If it would, kindly indicate how may tablets and how much apple cider vinegar, how many times a day and before or after meals. Can i take garlic directly by dipping it in honey? If I intake garlic daily morning for years together will there be any side effects, what would be the maximum days I can use this recipe. Can I try this if I have heart failure and my blood pressure drops already very low? Please i don’t crush or chew my garlic, but i CUT into pieces my garlic and swallow with water every morning before breakfast, will i achieve same result? as in weight loss? Please guide me hw mny garlic to take in a day and when. Hello sir, I wanted to ask is the breastfeeding moms can take garlic for weight loss? If yes, then how much? I was reading it here: https://www.interestglobal.com/garlic-for-weight-loss-tips-weight-loss-recipes-other-health-benefits/ and couldn’t find anything about whether breastfeeding moms should take it or not. By itself, eating garlic will not have a noticeable effect.